The Mets are on the road but still terrorizing Eastern League pitching, routing the Sea Dogs. PORTLAND – Tim Teufel, a former New York Mets infielder, knows what it’s like to string together hits in the minor leagues. And now he manages a team that handles the bats just fine. The Binghamton Mets arrived in Portland as the best- hitting team in the Eastern League, and the Portland Sea Dogs found out why Tuesday night. The Mets managed 14 hits and beat Portland 15-3 at Hadlock Field. The Sea Dogs saved their staff by having infielder Nate Spears pitch the ninth. He allowed a three-run homer by Kirk Nieuwenhuis. Luis Exposito hit a two-run double and Ryan Kalish had two hits for Portland (6-6), but Binghamton (7-6) dominated the game. “We’re a good-hitting team now, but it’s early in the season,” said Teufel, whose team leads the league in hitting (.274 average) but is last in pitching (5.55 ERA). Teufel, 51, spent 11 seasons in the majors, including six with the Mets. He played in the 1986 World Series, taking Bruce Hurst deep in Game 5. In his final year in the minors, in 1983, Teufel hit .323 with 27 home runs for the Toledo Mud Hens. On Tuesday, Teufel watched his team take advantage of eight walks with big hits. Nick Evans, the second batter of the game, sent a two-run homer over the wall in right-center. In the third inning, Portland starter Ryne Miller (0-1) walked the bases loaded. Jose Coronado then swatted a pitch over the right-field wall for a grand slam and a 6-0 lead. Miller was gone after three innings and 71 pitches. 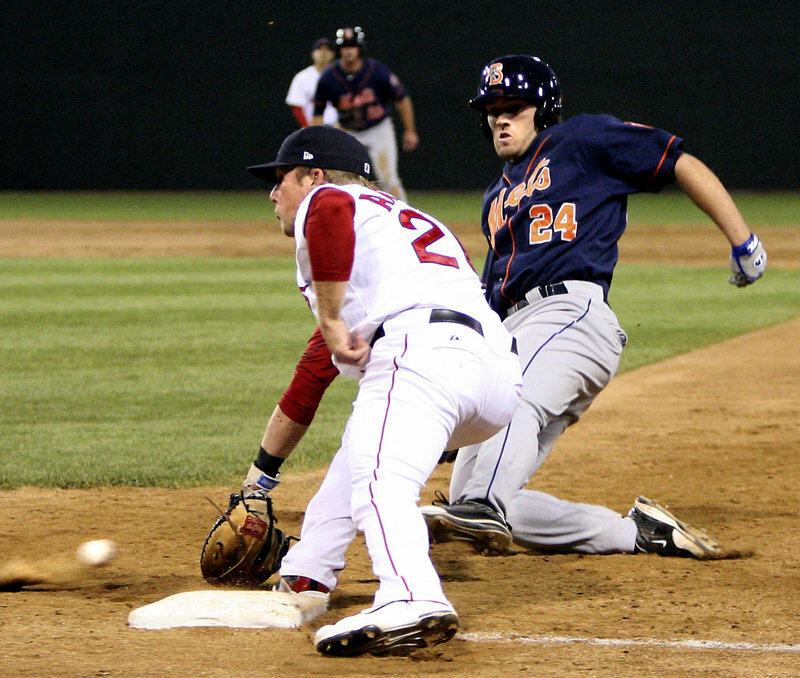 “He got into deep counts and struggled to find the zone,” Portland Manager Arnie Beyeler said. Down 7-0 in the fourth, Portland threatened when Mets starter Scott Shaw (2-0) loaded the bases on a hit batter and two walks. Ray Chang singled home a run, but Jose Iglesias popped out and Chih-Hsien Chiang grounded into a 4-6-3 double play. In the fifth, Kalish singled, Che-Hsuan Lin walked and Exposito sent them both home with a double down the left-field line. Exposito is batting .265 with a team-leading 10 RBI. Beyeler was pleased that he only need to use two relievers, Ryne Lawson and Jason Rice, in the rout. “We got through the game and didn’t kill our bullpen,” he said. The teams will play the rubber game of this series at noon today. NOTES: Left-handed reliever Andrew Dobies was traded to the Chicago White Sox for a player to be named or cash. Dobies, who turned 27 on Tuesday, was a third-round draft pick in 2004 out of the University of Virginia. 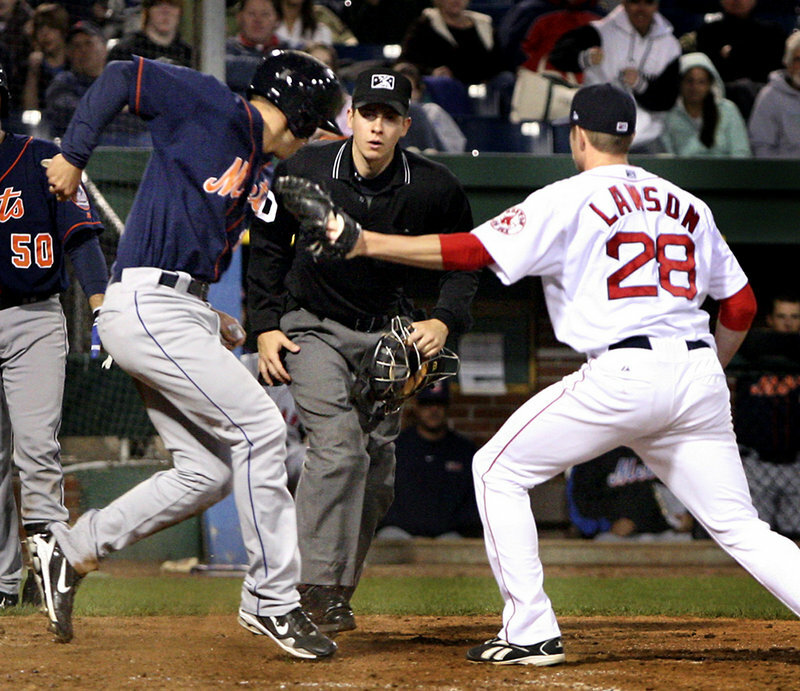 He came to Portland as a starter in 2006 and played a role in the Sea Dogs’ run to the Eastern League championship. Shoulder trouble has hampered him and he eventually moved to the bullpen. He made three appearances this season, with a 1.80 ERA and eight strikeouts in five innings. Infielder Yamaico Navarro remained unavailable with a sore wrist. Spears became the first position player to pitch for the Sea Dogs since Jay Johnson in 2008. The paid attendance was 3,736.